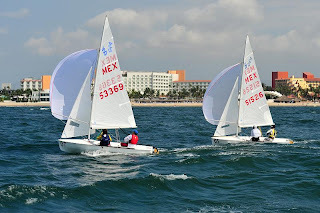 A new class is joining the Regatta Copa México at Riviera Nayarit this year; this is an Olympic class and was invited to celebrate the upcoming London Games. The Mexican Federation of Sailing will be supporting the 420 competitions, March 12th-14th and these will also feature international judges, which will make this event shine. At least 20 boats in this class are expected to participate in the 9 races that will be held during the three days of competition, which will take place at the Vallarta Yacht Club in Nuevo Vallarta. The 420 class sailing vessels are high performance two-seaters that can reach high speeds, as they have a Spinnaker and trapeze. Their hulls are very stable and are made with resistant fiberglass. This is undoubtedly the ideal boat for novice sailors who are just past the Optimist Class, which is usually used for children's categories. Today, this is the most widely used sailboat in universities and naval academies around the world.